Enfermé dans son sous-sol depuis dix ans, un homme paradoxal fait le procès de l’humanité – et le sien. Enfermé dans son sous-sol depuis dix ans, un homme paradoxal fait le procès de l’humanité – et le sien. Une interprétation impressionnante par Harry Lloyd, comédien anglais d’exception révélé dans Game of Thrones. Il retrouve ici Gérald Garutti, qui l’avait déjà dirigé dans Les Liaisons Dangereuses à la Royal Shakespeare Company en 2011. Gerald Garutti directs a British actor in his successful adaptation of Notes From Underground. A powerful text offered on a beautiful set design and in a rare setting. Rendez-vous is given on Friday 14th, 7 p.m., 7 rue Bourg l’Abbé. Les Bains. A constructing site at night. Fences everywhere. Are we mistaken? Have we misunderstood? No. A small group gathers and we catch sight of Gerald Garutti, the director, who invites us to discover a British actor during a theatre moment that Garutti has settled. We walk up the narrow wooden stairs up to a small room which windows are covered with newspapers. At its centre, a square stage made of an old books patchwork. The effect is superb. On this stage, this raft, a man is curled up in his chair, covered in a blanket. He stares at the people coming in and sitting down on the chairs placed around the stage. Next to him, a floor lamp that will, later on, be a spotlight. The character, his right arm plastered, will aim it to the audience. This set design, these lights, this presence, and this look create a very special atmosphere, between intimacy and anxiety. Suddenly words come out. Impulse, heroic rage. This man, if we correctly get it, has been confined here, in this underground, for ten years… An imprecator that puts the world, humanity and himself, on trial. In Notes From Underground, a text published in 1864. Dostoevsky imagines a narrator cloistered, ill, spiteful, in his forties. He was a civil servant, he quitted. He is apparently terribly alone. What needs does he have to give himself up like this? Is he telling the truth? Rage grows gradually. The man speaks to interlocutors that he literally sees. But he finally admits that he is not telling the truth and that he will be sincere. This is the story of his youth and the magnificent craziness of a vendetta: he will simply bump into a man whom he despises, and that will satisfy him completely… Just to say few words of it. This is a text that has always fascinated the theatre world and we have seen few versions of it. This adaptation is particularly clever. Both the directing and the interpretation are impressive. One may ask if it is possible to direct a personality as strong as Harry Lloyd’s. Yes, of course, and it is even him who desired it. The British actor, in his thirties, met Gerald Garutti when this director came to London, in 2011, to direct a script-in-hand staging of Christopher Hampton’s Dangerous Liaisons at the Royal Shakespeare Company for its 50th anniversary. Lloyd asked Garutti only three months ago to work again together. In Notes From Underground, there is all the power of a condensed alchemy. It is short, thick, heavy, set up in haste and it makes the underground man’s questions more palpable. 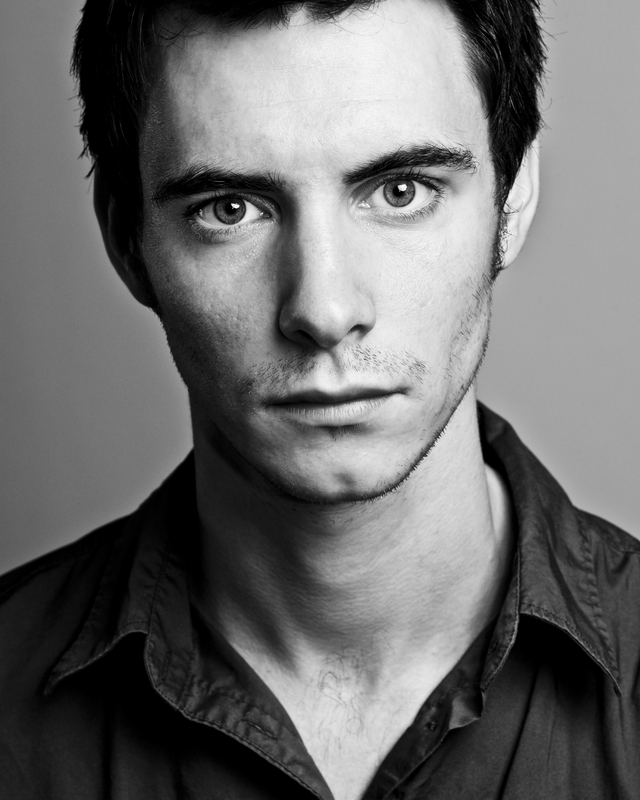 Harry Lloyd, and this we learn by reading the programme, is the great-great-son of Charles Dickens. He attended Eton and Oxford before becoming an actor. The literature is his raw material. It constitutes and penetrates him. He is a very famous actor in the UK, not only theatre-wise but also in movies and television. He has an astonishing power, soul plasticity, he adapts, goes from a muted secretiveness to vehemence, from softness to aggressiveness. He is used to it, like his character. He is the one holding up Dostoevsky’s burning thinking. A rare moment, a marvellous piece that shakes, moves, forces admiration. We go down the wooden stairs, wondering if we actually lived this instant. Outside, the city is rumbling. How personal and intimate of a theatre experience it is! This past weekend, we had the pleasure of seeing “Notes From Underground”. We have no substantial knowledge of the novella it’s adapted from so we can’t comment on that, nor can we really comment on the theatrical aspect of it. However, we did find it to be very thought provoking and Harry was mesmerizing to watch on stage. He completely transforms into a crazed man — so much so that you find yourself forgetting that it’s actually him — and his acting is completely on point, as well as being rather intense. He plays a man full of contradictions as he speaks to an audience that isn’t actually there about his life from “above”, telling stories of people he’s encountered and all too common situations that he found himself in. For us, though, our favourite part of it is the “interaction” Harry has with the “audience”. Waving, smiling, directing you to your seat, and sometimes laughing with/at you whilst in character as you enter the room and wait for it to start. (Also watching him before it starts, you could really tell that he was enjoying himself and was excited for the show. At the end when he’s taking his applause, you can also see this. You can tell he’s having an absolute blast!) He also speaks to/at you during his monologue, maintaining eye contact with every member of the audience multiple times, for quite some time. Some might find it unnerving, but we really liked how personal and intimate of a theatre experience it is! Having seen him in both “The Sea” and “A View From the Bridge” before, we think it’s definitely our favourite stage piece of Harry’s thus far, and we highly recommend that anyone go see it if they have the opportunity! Massive changes are afoot at London’s boutiquey-est fringe theatre, The Print Room. Formerly tucked away down a maze of posh streets, it’s relocated to the old Coronet cinema, smack bang in Notting Hill Gate, where a studio-sized theatre and the full-size movie screen are set to co-exist when the screen reopens next year. It’s an impressively atmospheric venue in a staggeringly plum location, and in theory, ‘Notes from Underground’ is the perfect attention-grabbing opener: rising star Harry Lloyd (‘Doctor Who’, ‘Game of Thrones’) performing his and director-designer Gerald Garutti’s adaptation of Dostoyevsky’s 1864 novella, twice nightly. Lloyd puts in a very game performance as the book’s unreliable, unnamed narrator (usually referred to as the Underground Man), an embittered former civil servant who rails against society with a mix of philosophical profundity, personal bitterness, and incipient madness. Initially Lloyd the star comes across a touch hammy. But after a while you realise his boomingly un-naturalistic performance helps Dostoyevsky’s wilfully obtuse words slide down a little easier (as does the dynamism supplied by a fine design team – particular credit to lighting designer Bertrand Couderc). However, that is not to say these ‘Notes…’ are easy to follow: ramblings that are digestible on the page are hard to really understand when spoken. Lloyd makes it entertaining as he can, but it's still a bit sloggy. His youth perhaps counts against him: the Underground Man’s world-view is more understandable coming from the jaundiced retiree of the book, while here he seems perversely puppyish and idealistic. Nonetheless, Lloyd holds the stage well, and is far stronger in the Underground Man’s moments of autobiographical lucidity, letting his mask of disgust slip as he launches into excruciating stories about his failed interactions with others – an assertive businessman, his former work colleagues, a sweet young prostitute. Better shows will surely come, but it’s an admirably ballsy way to christen The Print Room’s new digs, a decent swing at staging the patently un-stagable. One of London's most enterprising fringe venues, The Print Room, has moved into a permanent new home in Notting Hill, the beautiful but faded Coronet cinema, itself originally a Victorian playhouse. While the process of renovation and redevelopment gets under way, its first season in a temporary black box studio opens with an adaptation of the suitably dark and subterranean Fyodor Dostoyevsky novellaNotes from Underground. First staged in Paris earlier this year, this 70-minute monologue adapted by Gerald Garutti and Harry Lloyd, directed by Garutti and starring Lloyd, is an intensely claustrophobic experience that demands your attention.  Notes from Underground lends itself naturally to theatre in the way its first person unreliable narrator addresses an imaginary audience to explain his warped philosophy of life with a highly distinctive voice. Unnamed, this self-confessed 'nobody' has dropped out of his career as a lowly civil servant to live on a small private inheritance 'underground' where he spits out his contempt for mainstream society and his resentment at how it has mistreated him. Whereas Dostoyevsky divided his novella into two parts, the first based on intellectual theory, the second an account of the autobiographical experiences that led to the anti-hero's self-imposed isolation, this modern adaptation successfully merges them to produce a desperately personal expression of existential ennui. Of course, with a one-man show the pressure is all on the performer, and Lloyd delivers. Smiling manically and gesturing twitchily at members of the audience as they enter, then eyeballing them obsessively when he starts to unburden himself, he gives a convincing portrait of a self-contradictory, hyper-conscious man who hates to be ignored but who is incapable of sustaining any relationships, alternately needy and 'spiteful', condescending and envious. As well as his edgy paranoia and self-loathing, Lloyd also brings out the darkly absurd humour of his two-year stalking of an 'executive man' for an imagined slight, his ineffectual attempts at revenge on old schoolfriends and his strange encounter with a prostitute. With unkempt hair, threadbare clothes and a homemade arm sling, Lloyd presents a sociopath who seems to get a masochistic pleasure out of self-destruction. The performance is tightly helmed by Garutti, also responsible for the design featuring hardback books covering the stage backed by a collage of presumably unsent handwritten letters, while there are telling contributions from Bertrand Couderc's lighting and Bernard Valléry's sound. A disturbingly in your face portrayal of psychological breakdown, this show makes a compelling start to The Print Room's next phase of existence. A new stage adaptation of Dostoyevsky's Notes from Underground has opened at the Print Room, London. The production was developed in Paris earlier this year by Harry Lloyd (best known as the dastardly Viserys Targaryen in Game of Thrones) and Gerald Garutti. Lloyd performs the monologue, based on Fyodor Dostoyevsky's 1864 existentialist novella about a troubled young man who locks himself away from the world. The nameless man, now living Underground, recounts details of his past life Above, where a series of painful encounters led him to retreat from society and slowly self-destruct. Gerald Garutti directs. Runs until 1 November. "This is a memorable rendition of a story whose early grasp of the split consciousness of modern life still dazzles," says Dominic Maxwell in The Times. And judging by this utterly charismatic performance, Lloyd will be a star. Lloyd's gripping portrayal of Dostoevsky's anti-hero conjures a manic verve culminating in "an ecstasy of self-loathing", says Michael Billington in The Guardian. This unnerving 70 minutes, full of smouldering angst, suggests Lloyd is well-equipped to play the tormented anti-heroes of world drama. "With a one-man show the pressure is all on the performer, and Lloyd delivers", giving a convincing portrait of a self-contradictory, hyper-conscious man, full of darkly absurd humour, says Neil Dowden on What's On Stage. This disturbingly in-your-face portrayal of psychological breakdown is compelling. 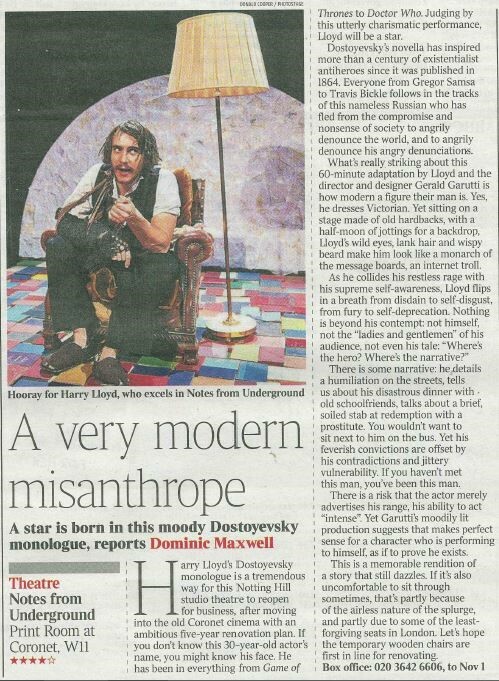 "Despite Lloyd's virtuosity and Garutti's thoughtful direction, it's hard not to conclude that the Underground Man is the sort of perverse figure it's much easier to accept on the page than in person," says Henry Hitchings in the Evening Standard. He tells us "I have over-philosophised" - too right. “I am spiteful! I am ill! 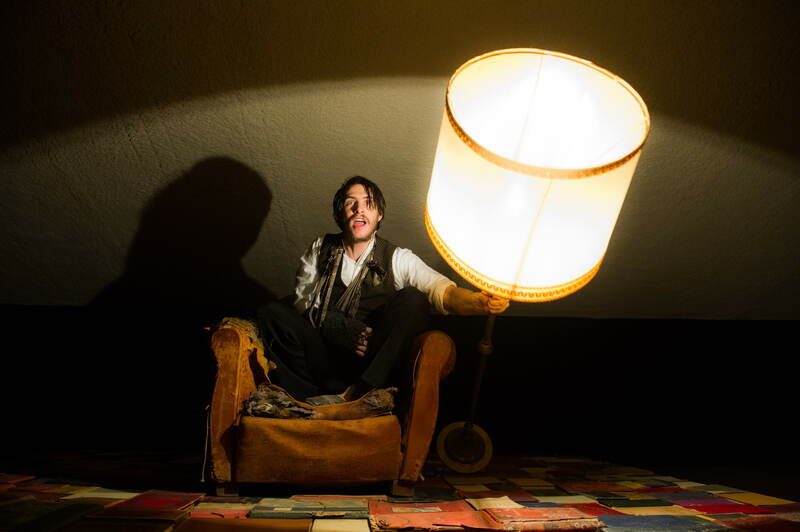 You are not going to like this!” With these words Harry Lloyd opens his one-man show that adapts the Dostoevsky 1864 novella that is often hailed as the first work of literary existentialism. 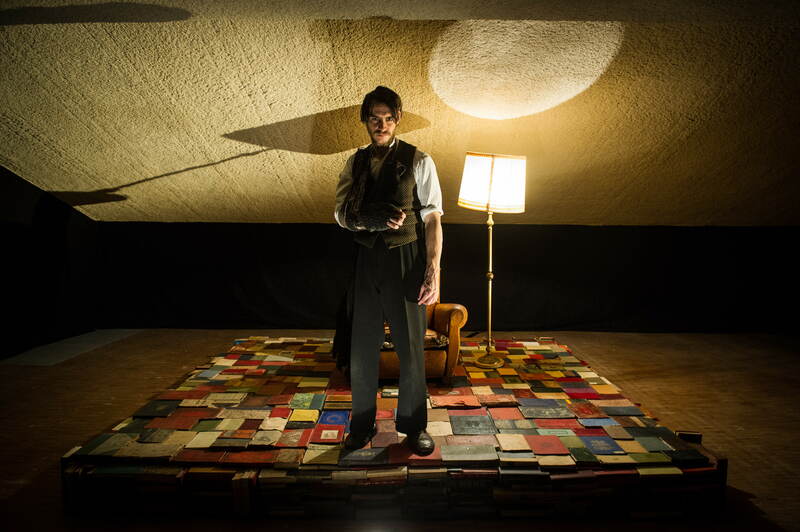 Lloyd is already on stage as the audience enter, darkly bearded, sitting in a dishevelled armchair on a floor created from stacked books beneath his bare feet, his haunted piercing eyes following viewers as they take their seats. He can’t wait to talk. Lloyd duly launches into a 70-minute diatribe that reveals the darker corners of the soul of an uneasy, unreliable narrator. The actor may be best known for his television work, including Viserys Targaryen from the first series ofGame of Thrones, but he’s gripped and fascinated here by the sheer theatricality of his character, who delights in his humiliations in a way that’s borderline masochistic. The question is whether he can engage the audience in the same way as they settle in with someone who is clearly most used to talking to himself (Lloyd the hectorer, pictured below right). As someone you would not want to be stuck in a train compartment with the Underground Man, as we know him, probably ranks up there with Coleridge’s Ancient Mariner. (Interestingly, Lloyd’s monologue refers to insects on a couple of occasions, putting us in mind of the absurdist heroes of Franz Kafka, and in formal terms of adapting prose for the stage particularly of his story “A Report to an Academy”, seen a few years back at the Young Vic.) How much can the tone be varied away from the purely manic, into moments of quieter introspection? Quite how much the comic interaction will come through – maybe not something you expect with this material, but it’s certainly there – will likely depend on the audience at each performance. Maybe Lloyd could go just a little further in bringing out such contrasts, but perhaps they will come as this four-week run develops (playing the piece twice a night is going to test his physical stamina too). But it’s a struggle to find empathy with a character whose interactions with human beings are so limited, and presented with an almost perverse delight in that very limitation. The closing episode relates his encounter with the prostitute Liza, with whom the Underground Man does establish a moment of real contact – he’s almost disgusted with himself for having done so – before intentionally shattering the possibility of any such shared emotion. The scene preceding that, where he encounters old school friends and invites himself to a reunion dinner, before revelling in their perceived rejection of him has even less potential for positive engagement. In that episode, on another note, it seems a strange decision by Lloyd and his director and co-adapter Gerald Garutti to bring the piece into an English context. In Dostoevsky’s story the friends and their unwelcome guest have gathered to bid farewell to one Zernov, who’s being sent away from St Petersburg to the Russian provinces, while Lloyd’s character goes along to fete a certain Briggstock, who’s off to Hong Kong of all places. It gives a very strange Home Counties note to a work that, as with most Dostoevsky, seems to breathe the dank air and inhabit the short winter days of Russia’s Northern Capital. Lloyd gives a four-star performance of a script that sometimes does not quite rise to that. Notes from Underground reaches London from Paris, and has found itself a very nice gaff (a word that catches well the spirit of the downtrodden room in which it’s set) indeed at the Print Room’s new home at Notting Hill Gate’s Coronet cinema. What used to be the smaller hall there has been transformed into a great 100-seater, black-box style space (in its cinema days the space seemed long and narrow, but it’s been adapted into something much roomier). The Print Room’s previous venue was under landlord threat, and the full project of adapting the rest of the Coronet is going to take considerable time and much funding, but first impressions of this new space are excellent. When it's all eventually finished West London will have a new cultural centre, housed in the elegant building that opened as a theatre in 1898. Apparently John Gielgud saw his first Shakespeare there in 1912. Harry Lloyd is only the latest player in a long stage history. Claudia Winkleman interviews actors Kevin Whately about starring as Herbie in the Chichester Festival Theatre production of "Gypsy". Actor Harry Lloyd talks us through starring in a Dostoyevsky play which he isnot only starring in but has adapted "Notes From Underground" which is about to open at The Coronet. Performance poet John Cooper Clarke visits the tailor Sir Tom Baker, to discuss the role of the suit in music as part of BBC Four and 6 Music month to celebrate the "Sound of Style". Thomas Magill, visits the winner of Museum of The Year - and guides us through the Yorkshire Sculpture Park. Samantha Buckley reviews this week's books including her pick of the week "Maggot Moon" by Sally Gardner. 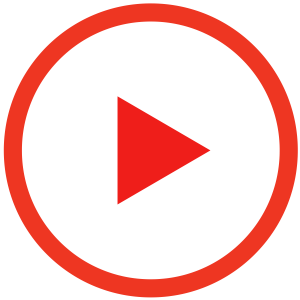 And music industry expert Nick Stewart looks at some of the releases including an exclusive play from the new Neil Diamond album and gets to talk to Mike Rutherford. In Game of Thrones Harry Lloyd played Viserys Targaryen. In America he's currently on screen in the TV drama Manhattan and he'll shortly appear both in the BBC version of Wolf Hall and in the Stephen Hawking biopic The Theory of Everything. But Lloyd's immediate concern is his new stage version of a 150 year-old Russian novel - an adaptation he's performing in a suitably 19th Century venue in London. Lloyd and director Gerald Garutti sit at a small table in a large crumbling attic several flights of stairs above a theatre in west London. As they discuss their new staging of Fyodor Dostoyevsky's Notes from Underground the last light of day fades behind them and we are left in something approaching darkness. The gloom isn't artistic affectation but because parts of the large Coronet cinema building in Notting Hill are without electricity. Built in 1898 as an 1100-seat theatre, the Coronet was used as a cinema after 1916. Until recently the intriguing warren of upstairs rooms was sealed. The architect WGR Sprague also designed some of the West End's most attractive playhouses such as the Noel Coward, the Novello and Wyndham's. The Coronet became a frail and forgotten cousin going quietly to seed in the suburbs. Now the fringe theatre the Print Room, founded in 2010, has moved in from a smaller location nearby. It's an ambitious undertaking which sees the cinema's former Screen Two adapted into an intimate 100-seat auditorium. Opening this week, Notes from Underground is the first production. "In some ways it's the perfect venue," says Lloyd. "It has the feel of somewhere not quite of today's world. It's a fantastically evocative building to be in." The show was seen in France earlier this year. Lloyd says that whole experience is now a jumble in his mind. "Gerald and I agreed on the idea and then it was just a whirlwind. "A month later I woke up on Eurostar having somehow done the show. I'm not sure how it all came together." Dostoyevsky's short novel of 1864 is regarded as one of the early classics of existentialism. It begins with the central character, a 40 year-old civil servant in Saint Petersburg, querying at length the point of human existence. "I read the book at the beginning of 2013 and I was fascinated," says Lloyd. "Then I was talking to Gerald discussing how we could work together. "His diary is very full so we knew it would have to be something manageable that we could achieve quickly. "Gerald said well maybe there's a one-man show we can do - and I mentioned the Dostoyevsky. "I was forced to think very fast on my feet." Garutti is an established director in France who also enjoys working in English. He had been impressed with Lloyd, now 30, when they worked on a project for the RSC in 2011. But they lost contact. "And then Harry wrote me a letter - and you should know that Harry writes beautifully. I was really impressed with his desire as an intelligent actor to know where he is going, with all the international career he has now. He was interested in going back to the theatre but he thought a French director might give him a new perspective on drama." Lloyd did the early work of adapting the Russian original. "I went to Paris and we spent two or three days talking and checking that we had similar feelings about it. Then I went away and wrote an overlong, waffly adaptation based on six or seven translations. I presented that to Gerald and he came back to London and we cut that down by a third. "Later in rehearsal Gerald pruned again and helped shape my script. We ended up with barely half of what I wrote originally." Garutti smiles. "I have to confess that Harry wanted a three-hour show but that would not have worked. I was the butcher and we are down to rather over one hour and we're both happy with that." The director's usual base is in Vaux-le-Penil, south of Paris. He's currently in rehearsal with the 180 year-old classic Lorenzaccio. "It's a play about disillusion and failure in a way. So it has a link with the Dostoyevsky. The difference is that Lorenzaccio has 30 actors on stage. But every play has a different challenge. It's why I love theatre." Lloyd has already appeared at the Old Vic and in the West End - so will he miss having a company of actors to play off? "I think for me the company is the audience. They're the people I riff off and who come in and make it different each night." He's decided that doing the show in such a hurry has ultimately been an advantage. "Time pressures mean you don't dither endlessly about the options before you: you get on and make decisions. Which is an irony as the story is partly about a man paralysed by life's options. "My screen roles in Wolf Hall and Manhattan and The Theory of Everything all have connections between them but this piece is so different - I'm not sure I can even classify what it is. We have to make it entertaining on stage but really it's about finding your way through your life and finding a meaning." Notting Hill Gate's Coronet cinema is the new home of The Print Room, a theatre previously tucked away on a side street off Westbourne Grove. Artistic director Anda Winters has big ambitions for the venue — eventually there will be three flexible spaces, one of which will maintain the site’s previous commitment to cinema. But for now there is a single 100-seat space, and this adaptation of Fyodor Dostoevsky’s novella Notes from Underground launches it in fairly low-key fashion. It’s a vehicle for Harry Lloyd, probably best know for his TV work — scientist Paul Crosley in the current American series Manhattan, arrogant Viserys Targaryen in the first season of Game of Thrones. Here, in a one-man show he has created with French director Gerald Garutti, he plays the Underground Man, a nihilistic maverick who has crept away from reality and lost himself in the dark recesses of his mind. Tousled and wild-looking, he greets us as we enter the stark auditorium. At first he sits in a battered chair beneath a lamp, with his diary entries fanned out on the wall behind him. Piles of books lie at his feet. “I warn you — I am not a cheerful man,” he says, before wondering, “What do cultured people like to talk about?” The answer is “themselves”, and the Underground Man begins a confession that is obsessively self-absorbed. This reveals the corrosive nature of his intelligence — he’s always undercutting himself, indulging in verbal games and tying himself in knots. Lloyd savours the character’s conflicts and excesses. The Underground Man’s default setting involves deriving macabre pleasure from despair and jeering at anything that smacks of utopian thinking. Yet he can switch abruptly into other modes — vanity, whimsy, inertia, a regal romanticism. The snarling, capricious parts of the performance are the most impressive — Lloyd’s dexterity is remarkable — but the character is more interesting when he lapses into a sedate reflectiveness. Yet despite Lloyd’s virtuosity and Garutti’s thoughtful direction, it’s hard not to conclude that the Underground Man is the sort of perverse figure it’s much easier to accept on the page than in person. “I have over-philosophised,” he tells us. Too right. Actor Harry Lloyd is all set to be the next big thing. If you don’t know his name already you may recall his face from one of his scene-stealing parts on TV: as the alien-possessed Edwardian schoolboy Jeremy Baines in Doctor Who or the deranged Viserys Targaryen in Game of Thrones. Theatre-goers may better remember him as the villainous Ferdinand to Eve Best’s Duchess of Malfi at the Old Vic. In the cinema he has played the young Denis Thatcher in The Iron Lady, complete with prosthetic teeth (he kept them as his party trick), and this season he appears in two of the biggest films: in a cameo as Lord Riot in the The Riot Club and as Brian, the young sidekick to Eddie Redmayne’s Stephen Hawking, in The Theory of Everything. With a showreel like that superstardom is surely only a cult role away. In the meantime, Lloyd remains able to meet me — unmolested by fans — in his favourite café, the English Restaurant, close to where he lives in Spitalfields. At 30 he is tall, dark and devilishly handsome, with floppy hair and a pointed courtier’s beard that he has grown to play Harry Percy, the hapless young suitor to Anne Boleyn in the BBC’s forthcoming adaptation of Wolf Hall. Lloyd’s talk is smart, fast and peppered with hipsterisms — “dude!” “sweet!” — and he exudes an infectious enthusiasm for his work. Most especially he is excited about his forthcoming one-man show, an adaptation of Dostoyevsky’s novella Notes from Underground, which he has co-written with French director Gerald Garutti. The play will be the first to open in the Print Room’s new home at the former Coronet cinema on Notting Hill Gate, now a boho theatre venue. Dostoyevsky’s story seems a curious choice for Lloyd. Widely regarded as the first existentialist text, it takes the form of a first-person narrative written by a man who has hidden himself away for 20 years to ponder the meaning of life, its paradoxes and pointlessness. What appeal does it have for an apparently happy young actor? During his melancholic period Lloyd sent a text to Garutti, a director he admires, and suggested they should work together. Gerutti agreed and asked what he was reading. Lloyd told him about Notes from Underground. “Great, write it!” replied the director. Lloyd spent six days adapting the book and soon he was performing the 70-minute piece around Paris, one night in a derelict hotel, the next in the studio that once belonged to Delacroix. Now he’s bringing it to London. An atmospheric clip on the Print Room website shows the actor at his most menacing. “You’re not going to like this,” he whispers. Lloyd is much happier now, you’ll be pleased to hear. He says the process of making the piece lifted him out of the gloom. Although from an outside perspective it’s quite hard to imagine what he has to be gloomy about. He grew up in west London, the child of parents who work in publishing, and went to Eton, where his talent for acting was spotted by the same gifted teacher — Simon Dormandy — who nurtured Eddie Redmayne and Tom Hiddleston. Lloyd went on to study English at Oxford, where he says he preferred to “mess around in the drama department, hanging out with bohemians and growing a scraggly beard” than to get involved with the Bullingdon Club set. Back on more comfortable ground we talk about the research Lloyd does for his stage roles. When he played Rudolfo in A View From the Bridge in 2009 he went to Sicily to learn more about the culture of his character. And for his part as a rent boy in The Little Dog Laughed in 2010 he travelled to New York to interview a hustler. He also worked hard at the gym to build a body that would make a closeted Hollywood star — played by Rupert Friend — want to pay for it. Lloyd has been filming an American TV series himself, a 13-parter called Manhattan, about the race to build the first atomic bomb. He plays an English scientist stuck out in a lab in the desert, a storyline that required him to live for five months in New Mexico. Lloyd says he enjoyed the vast landscapes and the big skies and found coming back to London a bit of a shock. “I got on the Tube and looked at the billboards and started panicking about what I hadn’t seen or done or bought. It took me a while to adjust.” He slowly returned to his regular pace, which includes nights at the pub with mates (“not actors, I see enough of them at work”) and cycling along the canals — his favourite way of getting around town. It may not sound like a blockbuster, but who knows — for Harry Lloyd it might just be the cult role that makes him a household name. Harry Lloyd is chewing over what exactly Fyodor Dostoevsky meant by the title of Notes from Underground, his 1864 novella, which the 30-year-old actor – best known as the short-lived Viserys Targaryen in Game of Thrones – has adapted for the stage. A fictional journal written by an angst-ridden young hermit, later nicknamed the Underground Man by literary critics, Dostoevsky’s book is often deemed the first piece of extistentialist fiction. Part manifesto, part memoir, it’s intense and rambling, recounting the reasons for one man’s complete withdrawal from society. Lloyd plays Harry Percy, Anne Boleyn’s foolish would-be lover, in the Mantel adaptations. Percy, an earl, isn’t his first titled toff either. The old Etonian has played two lords in as many years – Lord Riot, the ghostly founder of the Riot Club (screenplay by Laura Wade), and Lord Edmond Mortimer in Henry IV, part of the BBC’s Hollow Crown series. His CV is dotted with dukes, minor royals and that “pale, young gentleman” Herbert Pocket in Great Expectations. Spurred on by the French director Gérald Garutti, with whom he’d worked at the RSC, Lloyd spent six days compiling a compressed draft from various translations. The pair rehearsed it in Paris at the start of the year, then presented it around the city: in a derelict nightclub, in Eugène Delacroix’s old studio. “It was mad: wonderfully bohemian and romantic.” What’s more, it has sparked a taste for writing. Lloyd has just finished shooting his own online sitcom, Supreme Tweeter, about an actor who gets followed on Twitter by Kim Jong-Un. Relocation is the theme. The Print Room, an adventurous fringe venue, has upped sticks and taken over a Victorian playhouse-turned-cinema in Notting Hill, west London. A five-year plan to renovate the building starts with the opening of a 100-seat, black-box studio; with characteristic boldness, the first show is an adaptation of Dostoevsky’s 1864 story, performed and co-written by Harry Lloyd, best known for playing Viserys Targaryen in Game of Thrones. As we enter, a darkly bearded Lloyd, squatting in a rotting armchair, greets us with a faintly diabolical smile. He launches into a ferocious monologue, revealing the unhappy state of an intelligent, neurotic, exasperated man who has abandoned the world and exists in a state of wilful solitude. The manic verve of Lloyd’s delivery is gripping, reminiscent of Kafka – not least when he talks of being an insect – and Beckett, in his evocation of hermetic despair. Of course, Dostoevsky influenced later writers. I still think it a mistake, however, for Lloyd and his co-adapter and director, Gerald Garutti, to transplant the story from 19th-century St Petersburg to 21st-century London. The action not only grows out of that particular Russian city (“the most abstract and premeditated city on earth” in the original), but Dostoevsky’s hero is raging against the social utopians who would turn him into an ant-like member of a mathematically perfect society. But even if the updating is gratuitous, Lloyd vividly captures the storyteller’s sense of stored-up humiliation; his recollection of how, at a school reunion, he was treated as a pariah reminds us of how unforgotten insults never die. And, although the hero’s encounter with a prostitute is the weakest part of the story, Lloyd renders it with an ecstasy of self-loathing. It all makes for an unnerving 70 minutes, full of smouldering angst, that suggests Lloyd is well-equipped to play the tormented antiheroes of world drama. Un texte puissant donné dans une scénographie très belle. Gérald Garutti dirige un comédien anglais dans une adaptation très réussie des Carnets du sous-sol. Un texte puissant donné dans une scénographie très belle et des lieux rares [...] Un moment rare, un bijou d'intelligence dramatique qui secoue, émeut, force l'admiration. On redescend l'escalier de bois en se demandant si l'on a bien vécu ce que l'on vient de vivre. Dehors, la ville gronde.